Lately I’ve been addicted to the game of geocaching. Calling it a “game” though doesn’t seem right; it’s not what you’d typically call a game. I like to consider it more of a current day techy treasure hunt. Geocaching is a treasure-hunting puzzle-solving type of game, where people hide and look for secret containers (called geocaches) with the help of GPS. Some caches are straightforward: the clue is a GPS location, you go to that location and the cache is hidden somewhere there. Others can be a bit more elaborate, where you first have to solve certain puzzles and riddles before you can find the cache. The sizes of the caches also vary; in some cases these caches are tiny (see picture below), containing only a strip of paper to write down your name to show that you’ve found the cache. Other times it can be an actual box and people leave items behind for others to find. The first cache I ever found was in Portobello Road (check out the cache details here) and the result was the above nano cache. 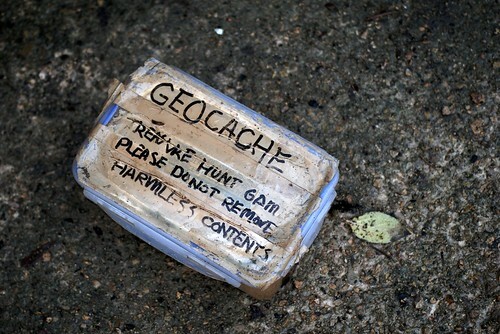 It’s a nice and easy geocache to start with, cause the instructions to find it are pretty straightforward. 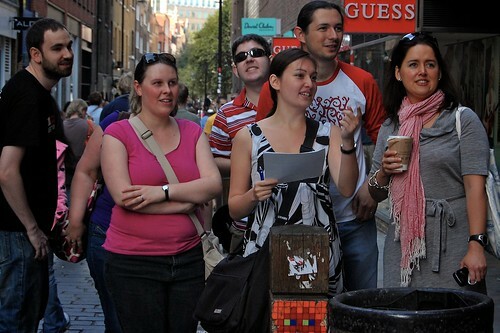 Another geocache hunt we did was for the second London Geek Meet. This one was all about spotting Space Invaders, cute little alien tile pictures that are part of a world wide street art project. We were supposed to find 12 Space Invaders and each of these would lead to a clue needed to solve the location of the final hidden cache. In the end we solved all the clues and found the final location, but failed in finding the geocache there. If you ever want to do something a bit fun and different around central London (it starts in Covent Garden), definitely check this hunt out. Finally last Sunday we finished a Geocache hunt I’ve been wanting to do for some time. It was based in Regent’s Park and would lead to a geocache hidden at a secret garden within Regent’s Park. A couple of weeks ago when we did the photo shoot with Carlo and Fabiana, I solved the first part of this hunt and calculated where the location was. I was expecting that it wouldn’t really be a secret location; I’ve been to Regent’s Park often enough and I thought I had seen most of the places. But this truly was a secret garden. Plus it was beautiful. And this was on a very rainy day in the winter; I can only imagine how this must look with luscious green in the summer. Even if you’re not interested in finding the actual geocache, it’s worth doing this hunt alone to find that secret spot (check the details here). So far I’ve been doing these geocache hunts with my mobile phone. I don’t have GPS on it; I just use Google Maps for approximate locations and although not very precise, it works well enough. I’m not completely addicted to this yet that I need a GPS unit, but if I ever find a cheap device, I’m definitely getting it. The problem is that most GPS devices are so expensive because they show a map and directions on them. What I’d want though is just a simple gadget that can tell me what the current GPS location is (beeper size, maybe?). Does anyone know if something like that even exists? 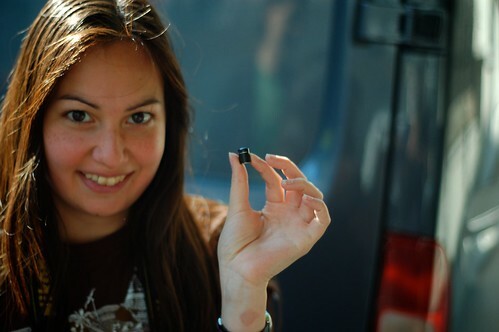 All in all, geocaching is a fun little game and a great way to discover new locations. I’ve already found some instructions to caches hidden in the Netherlands, around where my parents live. Let’s see if I can convince my brother and sister to go geocache hunting with me!